Thinking about fishing tonight and I am just beginning to realize the important role that weather has played on my trout fishing. There are several trout streams near our home. Being close to good trout streams make it easy to only go fishing when the weather is perfect. This year I have decided to change my fishing habits and to try fishing at different times of the day, using different fishing techniques and under different weather conditions. I can already report having some recent success doing some wintertime catch-and-release fly fishing! People who fish in Minnesota know that some of the best walleye fishing often occurs when it is raining along with windy conditions and after dark. However, people often fail to recognize the impact that weather conditions have on their Trout fishing. When confronted with less than ideal weather conditions you often need to try something different. For example: catching stream trout is unlikely when your favorite stream is flooded with muddy runoff after a heavy rain. Fortunately, there are lots of quality trout streams in the Driftless Area. The intimate smaller streams clear up fairly quickly and after a heavy rain usually can be successfully fished before the conditions on the larger streams improve. Local fishing businesses are always willing to offer advice to improve your fishing experience and help in finding. Some of the best afternoon and evening insect hatches are more likely to occur on those light rainy days when most anglers prefer not to fish as opposed to bright sunny days. I spent a couple years learning how to fish a nearby small stream — OK it is actually a brook that I can almost jump across. 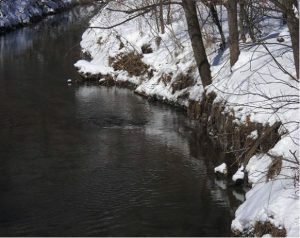 After an especially heavy rain last summer, flood conditions quickly changed the fishing patterns along this stream/brook. It will take several additional fishing trips before I once again learn how to best approach fishing this water. This is starting to sound like a justification to go fishing! We lived Up North for several years and I have to mention how winter winds affect Lake Trout fishing. The lakes in and around the Boundary Waters Canoe Area offer up some really fantastic ice fishing for Lake Trout. Very few people would even attempt to pull an ice house into a BWCA lake for a day’s fishing. Several times I’ve portaged into wilderness lakes only to be surprised to find them completely unsuitable for ice fishing because of their surface weather conditions. Those bitterly cold days with high winds and blowing snow conditions above the ice make it OK to stay inside and dream about fishing while sitting around a warm fireplace. — Why is the best fishing always on the more remote lakes and what’s wrong about dreaming of fishing?